It’s been another odd week. Whilst I was able to get most of my scheduled blog posts out in a timely manner, a large chunk of the week was made difficult by a sore neck and shoulders. I woke up on Wednesday morning and within an hour found myself in a lot of pain. It led to headaches and within a couple of days, I had to contend with nausea and digestive issues. Whilst the latter may not have been directly related to what I believe are pinched nerves, it certainly didn’t help matters. I am still in some pain but a change in pillows has helped me get sufficient sleep and reduced the discomfit upon waking. I can now play computer games, read and write without having issues with slight movements of my head. I am hoping to be back to normal in a few days. Hubby and I did a bunch of cleaning last week, resulting in the entire house being significantly cleaner and tidier. I pulled apart numerous cardboard boxes and threw them out along with lots of other junk. I also packed books into manageable piles in the spare room ahead of an intended sorting and banishment into the ether sometime soon. The enterprise frees up a lot of room in the house and it now feels a lot more empty. We also hear a lot more echo as we move around the house which is a little weird but it is weird in a good way. I can also be a bit more clear about my intention to create a craft room. Whilst this will likely be a thing in the future, I have other priorities now and all of the recyclables created a mess because of how they were stored. Hubby has put his foot down over them one as well, declaring that I will purchase real craft equipment and materials in the future rather than the cluster-f*ck the space had become over the past eighteen months. This will likely mean that I will get some shelves for the purpose somewhere down the line but that is something to think about later. On the gaming front, I now have four characters with awakenings. I would have had at least one more with an awakening if I’d felt up to playing some more. As I mentioned last time, I really like playing Musa. However, as hubby pointed out they are a poor choice for a lazy gamer. As such, I need to step up my game when I play it. Maehwa is nearly identical but it feels slightly different for those slight changes in how the skills work. Whilst I am unlikely to get an awakening for a few weeks, I do find myself feeling good about playing both it and Musa on a regular basis. In any case, I will likely get the awakening for my Valkyrie over the next week or so. On the writing front, I did manage to make some headway with Freak by writing a scene that will appear in one of the latter instalments of the series. I know that this doesn’t necessarily add directly to the first instalment in the series but it does offer me some insight into the motivations of two of the main characters. It also helped me make a decision regarding one of the other characters that will appear in all three of the series based in the same universe. This brings me to several important decisions. The first is that I will be putting my serial A Small Town on hiatus for a bit while I work on some of the stories set in the Freak universe. 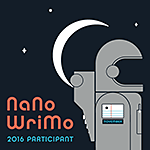 I am also participating in Camp NaNoWriMo beginning in April with a word count target of at least 25k for the first of the three Drake and Mallone stories which are set in Chicago and deal with the more supernatural elements of the setting. If anyone else is participating next month and wants to share a writing cabin, be sure to hit me up with the details of where to send an invite or vice versa. I’ll try not to “talk your ears off”. That is it for this week. A big shoutout to my new followers Yasumo from Unime, Monique from Healthy.Nappy.Nerdy.Mommy, and diabolical lurker Flavia from the Flavia the Bibliophile blog. I leave you guys with the following video clip from ProleteR. Categories: Blogging, Writing Diary | Permalink. Another week has passed. Across all of the east coast of Australia, many people were dealing with their own share of weather-related issues be it fire or flooding. Thankfully, hubby and I live in an area that is for the most part isolated from such things. There are certain parts of our township that can be cut from for days at a time when we get a downpour but most of the people around her will have some sort of plan to deal with such things. What have I been up to blog-wise this past week? I wasn’t able to get my anime review out on time again, which leads me to a bit of quandary. Much in all as I would like to write one each week, I also know that my habits have also changed in only a couple of months. I might have to drop it down to one each fortnight instead in order to have some sort of schedule. I seem to be keeping up with my weekday prompts, with some folks actually checking them out. The process has led to me finding some really neat resources online as well as some talented artists. That is a really neat side effect of trying to release weekday creative prompts that are diverse enough to give folks some wriggle room to play. I have also decided to post more reviews of Asian Drama and TV shows from now on given that the storytelling style is a bit closer to what I am trying to emulate with Freak. On the writing front, I still haven’t finished writing the first chapter of Freak Book 1. You are likely wondering what the heck is up. Well, it occurred to me that I was lacking some information about New York City, the place where the story takes place. In spite of seeing numerous shows and films set in the city, I really didn’t know much about this iconic place. So, I went about looking at maps to make sure that I had some idea of how my characters would get around via something as mundane as public transport. I also learnt a few pieces of terminology specific to the way in which the city is laid out. It was a lot of fun but I still have more to learn. However, what I did learn was enough to get me through the first chapter. To the word count of the chapter, I am up over 5k now. The word count has fluctuated as I amended certain things to match up with what I learned about the city and about the architecture of large buildings such as high-rise hotels. Given that a large portion of the first novel occurs in a hotel from the staffing side, it made sense to get the description of how they would travel as close to right as possible. Categories: Blogging, News, Writing Diary | Permalink. Another week has passed. Hubby and I still haven’t moved the exercise equipment into our lounge room as yet. I did manage to finish and review the anime series Working! !, which turned out to be a fun watch. It took me ages to get to it, though. I also started posting weekday creative prompts and highly encourage folks see if the prompts are helpful. To the writing front, I only managed to release the minimum instalment of my serial A Small Town last week. I had hoped to get another one out, but I got distracted with other stuff. I do intend on continuing the serial until the conclusion of the first season. However, the frequency will likely drop to closer to the originally intended weekly instalment. On top of the weekly serial, I found myself working on the first chapter of Freak Book 1 over the weekend. I am close to finishing the rather lengthy chapter and will likely post it and the prologue later in the week. I will have to do some revisions before then to polish it to a standard that I deem worthy, but at least it will start being released into the wild much sooner than I had initially intended. Another week has passed and it was a productive one at that. It is a rarity, but it does happen on occasion. That being said, I wasn’t able to review an anime series for a second week in a row, but I did make minor headway with the series that I am currently watching. First up, I managed to introduce the main story arc for my serial A Small Town. I’d known since writing the first chapter what the main foe would be, but I was getting quite anxious in the lead-up to the appearance of our nasty monster. Now comes the challenge of bringing all of those clues together so that our heroes can end that sucker. Alas, this is made more difficult by our amnesiac Moon Dog, Egg. Okay, you are probably wondering why I added Egg in the first place. When I started writing the first chapter, I only knew that the first scene would be about a mother and son moving. Then, weird stuff started happening and it transformed into an odd rural-themed Urban Fantasy thing. Given that I am not a true Pantser, I started making some very sketchy notes to plan it out, in the form of chapter headings with a very distinct flavour. This is by no means the most efficient method, but I often feel too bogged down by blow-for-blow outlines. A character outline tends to be a lot more useful to me. You are likely reading this section wondering what the hell is up. A lot of writers do indeed see themselves as either a Planner or Pantser. For me, the Planner model fails in that it is too restrictive and I find myself taking more time planning out a scene than writing the blasted thing. The Pantser model also fails because there is not enough structure. In the end, you have to do what works for you, and I do believe that I may have found the model that currently works for me. That being said, I wasn’t able to get out a chapter of the serial today because I didn’t feel very well today. I will try to get one out tomorrow instead, on top of my manga review. It is going to be one busy day, but I think that I am up to the challenge. Let’s hope that the chapters that I post from now on will get better rather than worse. I really want the quality of my writing to improve as a matter of pride, but I realise that this will take some time. Second, hubby surprised me last night by spontaneously deciding to clean and reorganise the lounge room. 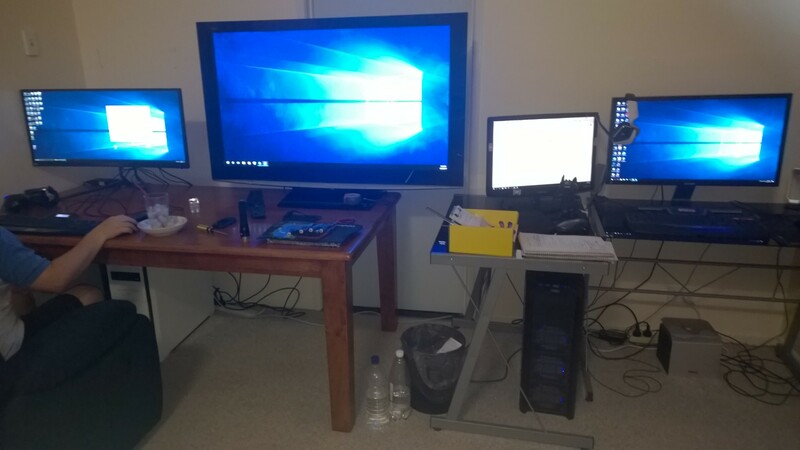 Apart from not moving the exercise into the room yet, we are now set up with my old monitor set up for my machine and our plasma TV hooked up to hubby’s machine on top of his Predator X-34 ultra-wide monitor. It is glorious and well worth the several months of waiting around. The only problem is that I now get chilled by the air conditioner that points directly at me from the other side of the room. It is such a small price to pay. Anyway, here it a crappy picture of our new set-up. I wrote three solid chapters of the new serial, which was awesome. A story is emerging before my eyes. It is a weird experience, but I am still digging it. The fourth chapter was posted just before I started writing this update, and I have to say that I really like how things are playing out so far. Sure, it initially started as a random sentence, but it has quickly transformed into a viable story and I now have several major plot milestones that I have mapped out in brief detail. There are still a few more characters to be added, but that is for future instalments. I think that a lot of the assist goes to a site called 750words and the Grammarly app for Chrome. 750words is a writing challenge of sorts that makes use of a mostly distraction-free writing platform. I say “mostly” because I still see my other link tabs and various browser buttons. You can modify the area where you type, though. The site also creates a bunch of information about your writing sessions, including words-per-minute while writing, an indication of how much time that you are typing over the log-in period, etc… This may not seem like much, but it does give me some idea of how my writing sessions play out. You can even follow statistics for other users to see how well that they are doing over the span of each month. As for the Grammarly app for Chrome, it is very helpful in me quickly addressing typos during the second parse over my writing. I don’t do much editing, but I do clean up spelling errors and change overused words. As for updates to the blog, I have started watching a couple new TV shows, which includes a live-action adaptation of a manga series that I love, Please Love the Useless Me; and the surprising CDrama series Love O2O. The two shows are a lot of fun so far and I look forward to reviewing episodes periodically on top of the series that I regularly review each Wednesday. I also added a bunch of new listings to my Pimp-A-Patreon page and modified the Review Schedule page. If you have a Patreon project that you want to be considered, be sure to drop me a line. And as always, I welcome anime, manga, TV and music suggestions.